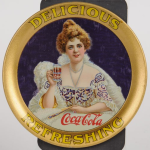 Our Image Gallery has images for many of the rarest and earliest Coca-Cola trays that date from 1897 through the 1950's. 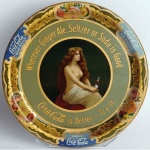 After the 50's Coca-Cola began to produce many more trays that are very common and can generally be found on other sites and as it would take too much time to gather them all we've stopped with what he have for now. 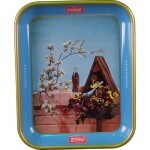 In the future we plan on expanding our gallery and including many more trays. 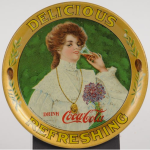 Keep in mind that many of the designs seen here were reissued as reproductions by Coca-Cola in the 60's, 70's, and 80's so just because you have a design that matches a 1913 tray does not necessarily make it authentic. 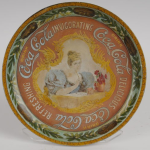 We're happy to help you authenticate your tray, just send us pictures of the front, back, and close ups of the smaller text on trays to help us see what you have. 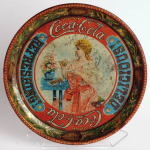 When submitting, please also send along the measurements of your tray and we'll be able to authenticate it and tell you what it will be worth.